The velvety red roses were in honour of our wedding anniversary. For several days their smooth perfection graced our lives. It was, however, the markings of time that, in the end, were most beautiful and stirring to my artistic soul: the delicate discolorations; the lacy, shriveled edges; the graceful nod to an inevitable end; and, ultimately, the pleasure of the unexpected. Over the years I have used many different mediums, in isolation or combinations, to achieve what for me is the defining beauty and elegance of flowers. I find myself constantly trying different ideas, styles, and techniques. 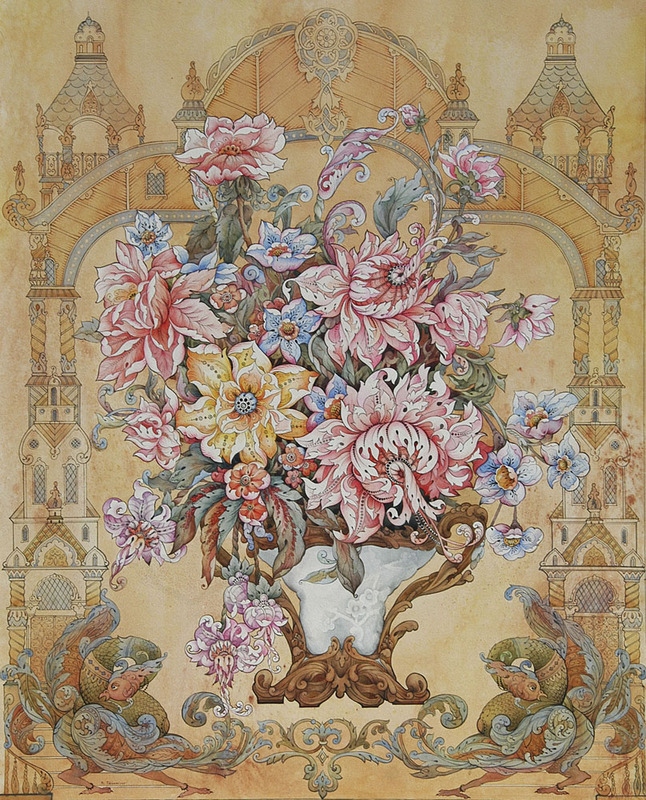 I enjoy combining the flower’s natural beauty with scrollwork, fairytale subjects, and architecture. In this work I began by tracing my drawing onto a piece of Strathmore Bristol board. Masking off the bouquet and vase, I endeavored to achieve a rich antique watercolor background. After allowing the background to completely dry, I removed the mask and outlined the foreground subjects with ink using fine brushes. Finally, I finished the work with the application of stylistic watercolors in order to give the flowers a distinctive coloration. I envision a painting in almost everything I see. I like to take an ordinary subject and enhance the perception of it; invite the viewer to take a closer look. Adding drama and mystery through the use of powerful lighting, reflected surfaces, and exaggerated contrasts, I strive to transform simple everyday life into un-ordinary, not-so-still life. 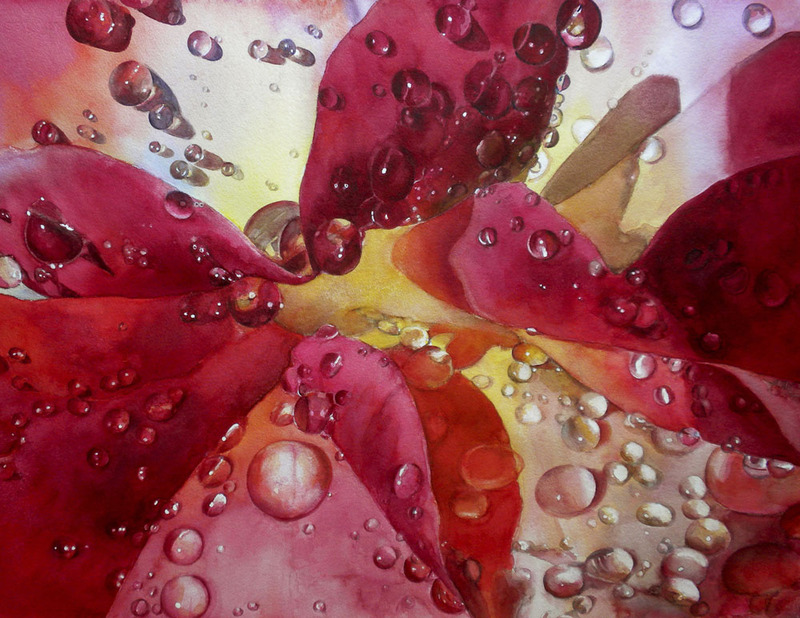 This painting began as a study of a flower, but I knew that the real areas of interest were the water droplets and how their various colors and shadows interacted with the flower. 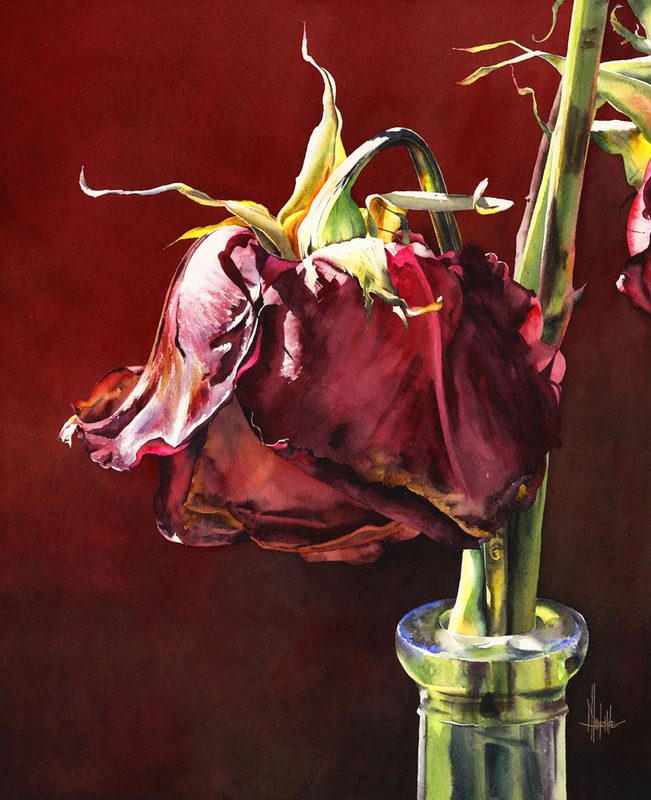 Watercolor presents enormous challenges and rewards. I love how the medium takes command. The artist starts the process, but the paint takes charge and leads the work to a sometimes unintended outcome. It’s always exhilarating. Bogs are fascinating to me. I love the animal and plant life found within them. The fact that many of the North American carnivorous plants are found in these unique environments only add to their mystery. The majority of this acrylic painting was done plein air, late spring, with wet feet and a chorus of mosquitoes as accompaniment. Sarracenia purpea, more commonly known as the Northern Pitcher Plant, is a plant adapted to the acidic Sphagnum bogs of the north. Like most plants, the pitcher plant needs nitrogen as a nutrient for development. Acidic bogs provide little nitrogen and pitcher plants have adapted by becoming carnivorous. Their unique design is the result of basal leaves melding together to form a water catching tubular base. This hollow base is open to the sky so that it can collect rain water. The plant secretes enzymes into this water-filled cavernous bulb. The neck at the opening of the tube is lined with many recurred hairs which point down to the bottom of the plant. These hairs attract insects. They allow the insect easy access into the water-filled cavern but will not let the insect exit. The insect eventually tires trying to escape. It will fall into the enzymatic waters of the basal tube and drown. The insect is then dissolved and digested. The pitcher plant gets its nitrogen. There are 17 species of pitcher plants in North America. Because of their curious nature, many species of pitcher plants are endangered due to plant collectors and loss of habitat. I am always searching for inspiration for future paintings, sometimes overlooking the obvious. Shadowplay was “posing” for me right aside of my studio drawing table, but I only considered it for a painting subject upon seeing the blooms cascade into the shadows of the plant’s platform. 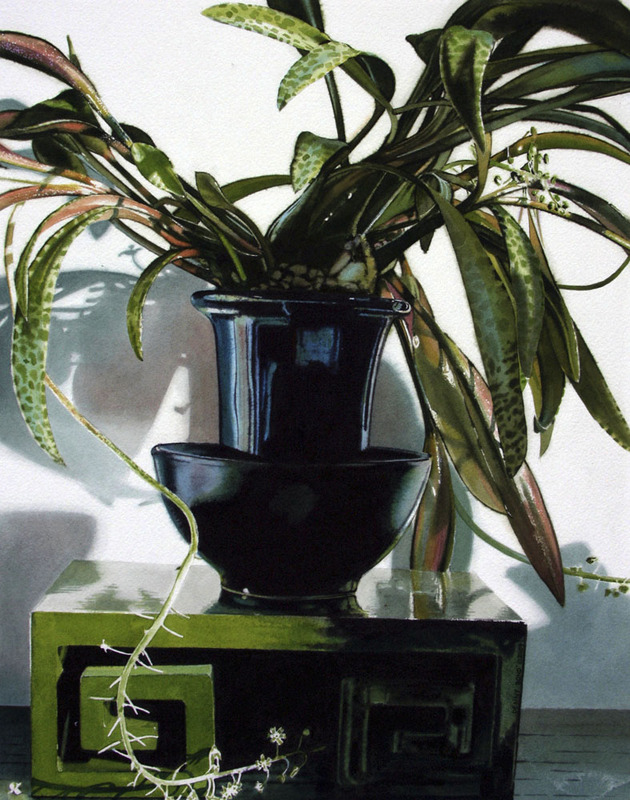 Using natural light, the interplay of the background wall shadows created the visual diversion from the plant subject and a more interesting composition.